These are just a few of the many positive customer comments that we have received. "Thanks for the fabulous job. Our new sign has been admired by many"
"Many thanks for this. We love the sign. Lots of positive comments from parent's this morning as well. Thank you for doing such a fabulous job"
"Hi, we have just returned from our 2 week half term and I would like to tell you how pleased we are with the signs you put up in our school. They look even better than we expected. The quality and colour's are excellent and the installation was quick and trouble free too. The guy's who came were very efficient and did a great job. The parent's and children were also very impressed. I was pleased to have organized it as I got so many nice comments. I have passed your details onto another school who have been asking where we got them from. 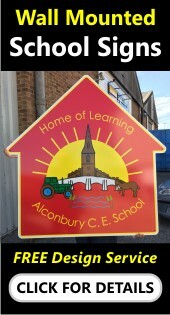 Thanks again"
"I am writing on behalf of the school to thank you for the signs your company recently produced for us. I know there was a small error in the original production and I thank you for sorting this for us so swiftly and professionally. We would have no hesitation in recommending your company to others. Your workmen worked efficiently and in a manner that represented your company very well which is important in a school environment. The school can now be recognized and the signs look fantastic. Once again a very big Thank You"
"I appreciate that our order was rushed through so a big thank you to all concerned. The signs look lovely"
"I have just taken delivery of our new sign and want to express my appreciation for such a high quality manufactured item. The sign will look excellent when in place and will be a major focal point for people visiting our school. Please pass on my thanks to all your employees involved with making our sign. It is good to see quality products still being manufactured in the UK"
"Just a quick note to thank you and your staff. Our grand opening went exactly as planned and many of our visitors commented on how nice our new signs looked"
"Please thank your staff for a job well done"
"Dear Jo, I was asked to send you a quick note to say how pleased we are with our new school signs. We are all over the moon. We are looking at more signs for the school and will contact you very shortly. Once again thank you"
"I would like to say a big thank you from Springwell Community Special School. We received our school signs yesterday and they are brilliant. Thank you again"
"Hi, can you please thank all your staff for all their efforts in producing our new college signs. For my part I did not relish the thought of organizing all this work but in hindsight it was made all the easier by Steve and the rest of your team who worked so very hard on this project. Your invoice has been passed for payment and I look forward to dealing with your company again in the very near future"
"I had to write to thank you for such a brilliant service in supplying a memorial sign for one of our Governors, Clive Barker, at very short notice. The memorial service is tomorrow and it will be comforting for his family and friends to know that his contribution to our school has formally been recognized. It is much appreciated that you supplied and delivered the sign withing 24 hours and I certainly will not hesitate to use your firm in the future - With a little more notice next time ! Please feel free to use this letter of satisfaction in any way you wish. Thank you once again"
"After being let down by another company who's salesman failed to show for appointments made we are so happy that I accidentally phoned your company by mistake to complain. After speaking to Jo Cheesman in your office it seems that this is quite a regular occurrence for you. Anyway Mr Martins loss is our gain as the signs you manufactured and installed for us look absolutely fantastic and match exactly the brief given to you by our designers. We have now had so many positive comments and new inquiries at the Barnet Nursery that myself and the other directors have decided to re-brand our other for nurseries with new signs from your company. Either myself of Sarah will be sending you details of exactly what is required in the next few days"
"Just a quick email to thank you so much on behalf of all of us at Woodhill School. Our new notice cases were delivered last week and our site manager has now managed to fit them to the wall. They are so much easier to use than I imagined. Gone are the days of me balancing the door on my head every time I put up our newsletter. Can I please order another 2 keys as I have already managed to misplace one of those that came with the notice cases"
"A huge thank you to all concerned. Our new signs were installed yesterday afternoon and look bigger and better than I imagined they would"
"Please find cheque enclosed in full settlement of your invoice 11676. I would just like to say Thank you for all your efforts. Our new Banners arrived on Monday and look fantastic. I would not hesitate to use your company again or recommend you to others"
"Please pass our thanks to all your staff who were involved in producing our new signs so quickly and efficiently. We have had so many wonderful comments so much so that our chair of the PTA will be contacting you shortly for a new PTA Noticeboard"
"Thank you, our new signs arrived this morning. They look bright, colourful and extremely well made, just what we wanted. Your invoice is in the office for payment. All I need to do now is to twist our site managers arm to fit them. This will be easier said than done"
"Hi, just a quick note to say a big thank you for our new school notice boards. They arrived yesterday and one of our parents kindly put them up for us this morning. The extra title boards you supplied make them really stand out and co-ordinate with our school colour's nicely. 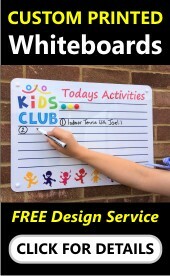 I would like to order another 4 notice boards boards but I need to wait for agreement from our bursar. In the meantime once again many thanks for all your help"